Yogurt is one of those items that I always keep stocked in our refrigerator. From smoothies, yogurt parfaits, cooking, baking or just eating, we can go through quite a bit. I find myself grabbing several containers on just about every trip to the grocery store. Yogurt is great for an easy breakfast as well as for a quick snack. I use Greek or plain yogurt for cooking, baking and as a substitute for sour cream. Lately I've been trying to find quick and easy breakfast options not only for my kids, but for me as well. My kids get up pretty early for school, so the last thing on their mind is breakfast. Sometimes I feel like I am forcing them to eat, but I don't want the going off to school hungry either. Most times I'm lucky to get a smoothie, oatmeal, cereal, fruit or muffins and fruit down them. 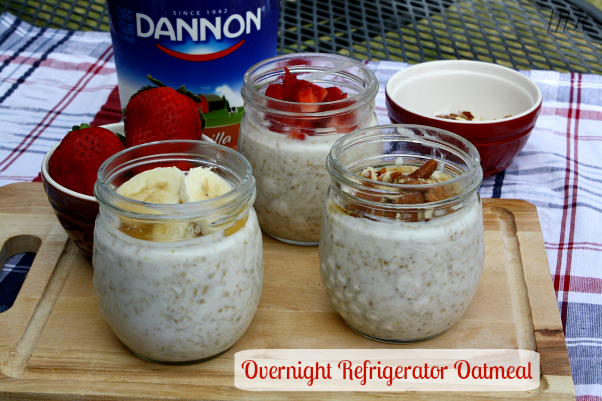 This Overnight Refrigerator Oatmeal has been a wonderful option. This idea has been more adult friendly than with my kids. I just recently got my little guy to start eating hot oatmeal, so he wasn't too crazy about the whole cold oatmeal idea, but for me...... I love it! Refrigerator oatmeal is an easy no cook breakfast perfect for any one on the go, or for someone who doesn't make time for breakfast. 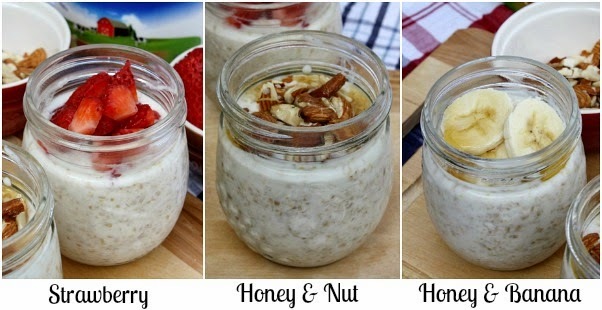 I make these up the night before and place them in individual mason jars for a perfect grab-and-go breakfast option. Each of the flavors start with the same basic ingredients, vanilla or plain yogurt, steel cut oatmeal, almond milk (plain or vanilla), ground flax seed or chia seed (not pictured), and fruit and nuts of your choice. 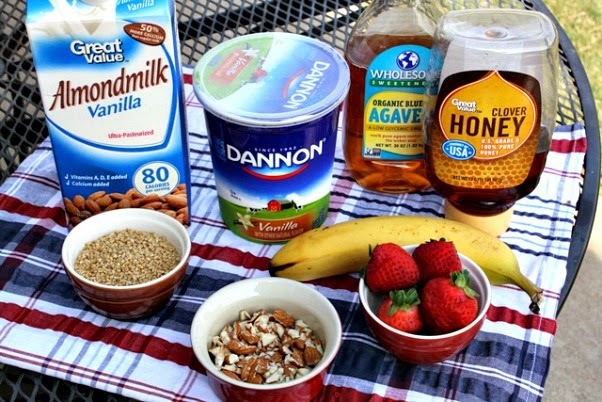 Use honey or agave nectar to sweeten the oatmeal. My three favorite flavor combinations are, strawberry, honey nut and honey with sliced bananas. Feel free to experiment with different flavor combinations and customize your own varieties. Each of these flavors store well covered in the refrigerator for up to 3 days. I like to pull the jars out of the refrigerator and let them sit at room temp for about 15 minutes before eating, so they're not too cold. You can also warm the oatmeal in the microwave just before serving (make sure to remove the metal ring and lid). Stir oats, almond milk, yogurt, and flax seed together in a large bowl. Separate oatmeal mixture into three half pint jars. Add a lid and a ring and place the jars in the refrigerate for 8 hours or overnight. Add toppings of your choice, eat and enjoy. The toppings can also be added before closing the jar. Cook's Note: Old fashioned oats can be substituted for steel cut oats, but the steel cut oats are less processed. Each of these flavors store well covered in the refrigerator for up to 3 days. Banana topping only last about 2 days without browning. You can also warm the oatmeal in the microwave just before serving (make sure to remove the metal ring and lid before heating). Before I go I also want to share this quick and easy kid friendly snack with you. While at the Walmart Headquarters earlier this summer, the Walmart Moms learned about some quick and easy breakfast and snack options using Dannon Yogurt and Kellogg's Cereal. One of the recipe ideas that caught my eye were these yogurt fruit dippers pictured above. 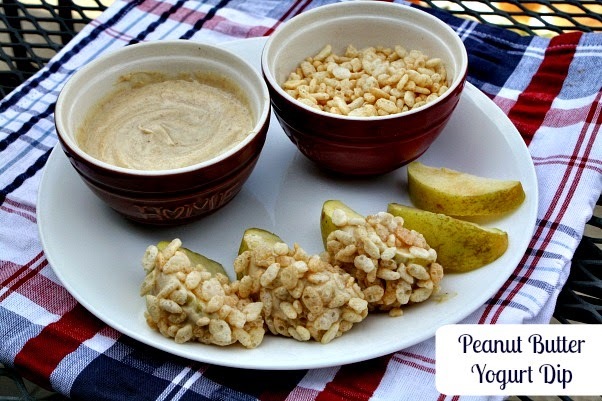 The fruit dippers are pear slices (apples can be used as well) dipped into a peanut butter yogurt dip, then rolled into dry cereal. I did tweak the recipe slightly making it a bit healthier. Since returning home my kids have been enjoying these for a quick breakfast and snack option. I have also added the peanut butter dip to my kids sack lunches along with apple slices, so this has been a huge hit in our house. In a small bowl whisk together yogurt, peanut butter and honey. Place the yogurt dip into small containers for dipping. Dip fruit slice into peanut butter yogurt, and then roll in cereal. For more yogurt inspiration stop by the Walmart Food & Celebration Page, as well as my fellow Walmart Moms and their blogs. Ore the oats already cooked or raw? They are uncooked. They will swell up form sitting in the refrigerator. Any reason you can't use regular milk? You can use any milk. I prefer almond milk for health reasons. Does it keep beyond one day? Since it makes 3 servings, just wondering, in case I can't get the rest of the family on board. Im confused...do you warm this up in the morning before eating it, or is it supposed to be cold? This is a cold oatmeal. It is delicious too ! They don't really swell up. They just get softer with bit of crunch. Even cooked steel cut oat have a bit of a nutty crunch. Steel cut oats are unprocessed. Old fashioned and quick oats are processed. If you want a softer oat then you need to use old fashioned oats. I make this all the time and just heat them up in the microwave when I am ready to eat. So many flavor possibilities, Yum! I made this for my daughter's family as they are always rushing off to school every morning. She is a teacher who is also nursing a baby and needs to keep her milk production up. I added brewers yeast to hers along with some ground flax seed to make it more lactation friendly. Wow did it work great!!! We did find them a little bland so ended up adding some extra sugar or honey depending on who was eating it. But what a great idea! Thanks! Is it supposed to be watery? No it is the consistency of a thick custard.